I absolutely love scented candles, sachets … anything that is aromatherapeutic. 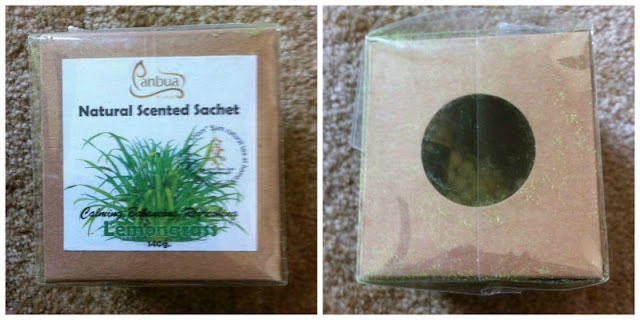 So, you can imagine that I was very excited to get the Scented Sachet Lemongrass, but completely disappointed when it arrived. To start, there was some sort of lime green powder all over the box that hopefully you can see in my photos. So, right away I was put off. Being that the item is described as a sachet that is what I expected. Instead, what I received was a mesh bag that contained what looks like tiny Styrofoam balls and a bottle of “essential” oil. The bottle was also covered in the weird lime green powder! Perhaps you’re experience will differ from mine and you can find the Scented Sachet Lemongrass by Nice & Nature on Amazon with a list price of $28.99 and on sale for $18.99. Let me know if you have a better experience then mine.